Catching a bus in Canberra is easy. Our fleet includes easy access, luggage racks, priority seating and wheelchair space. Explore passenger information for etiquette, safety, travelling with animals and other features. Save time and money – try Park & Ride, Bike & Ride and bike storage options. Once the driver has closed the doors, they may not be able to stop to pick up additional passengers. 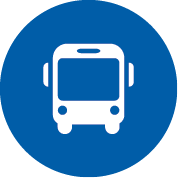 If multiple buses are queued at a stop or station, proceed to the doors of your identified bus for boarding. Failure to do this may result in the bus departing without the driver realising that there are passengers waiting further down the platform. Wait for other riders to exit the bus. Keep to the left hand side as you enter. Tap on with your MyWay card (if you are using one) or pay a cash fare to the driver. You have the option to use the rear door at bus interchanges and major stations if you’re using a MyWay card. Stow away any bulky items (e.g. strollers, oversized baggage, walking frames). Sit or stand where available, moving to the rear if the bus is crowded. Free priority seating for those who need it. Tap off with your MyWay card if you are using one and exit from the front or rear door of the bus. Don't cross the road until after the bus has gone. Other drivers cannot see you if you walk in front of the bus. The rule is: When the bus is gone, that's when you cross. Press the bell for the next stop. When the bus stops tell the driver your problem and they will assist you to find the correct bus. Check the direction of travel on your timetable or Journey Planner. If you are not sure where to stand, call us on 13 17 10 for help. Left something on a bus? Find out how to find your lost property.